Crystal Ladder is made of industrial rope with measured splices to accommodate seven clear quartz crystal wands as rungs. In crystal therapy, clear quartz is associated with the crown chakra and used to amplify energy and thought; cleanse the soul, absorb and transform negative energy including electromagnetic radiation; strengthen the immune system; and enhance psychic abilities. 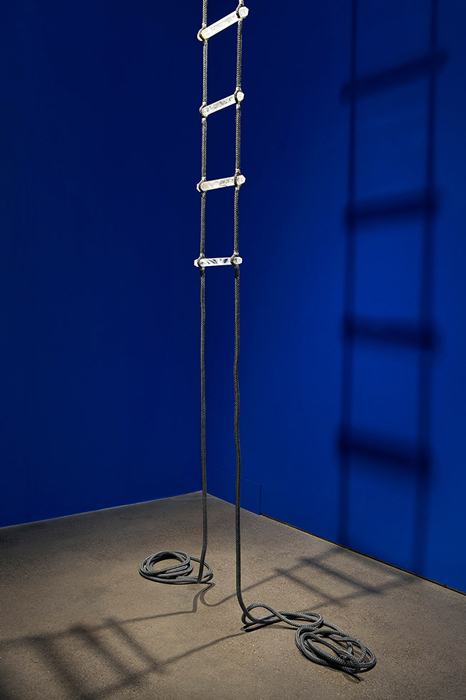 Conceptually founded on the function of a rope ladder as an apparatus that facilitates temporary vertical access, Crystal Ladder represents an ephemeral and unfixed opportunity for ascension.